One Big Yodel: America's Little Switzerland. Really. The Frau recently went back to her Swiss home away from home, New Glarus, Wisconsin, for a very good reason—to participate in her first-ever triathlon. But this was not just any triathlon, mitenand. This was the Alphornman Triathlon. So how could she not participate? The race began with three men playing alphorns. The race ended with a four-hour Volksfest concert featuring Swiss choirs, Swiss music, Fahnenschwingen with alphorn accompaniment, and a few Wilhelm Tell Guild remarks in Tell Shooting Park. The festival even featured a group from Switzerland itself, the Jodelchörli Alpsteinblick Abtwil. The Frau spoke German with a couple of the men from the Swiss group and English with a couple of the people from the New Glarus groups. She fit right in with her strange American Swissness, right there in her own country. The entire weekend was wonderful. 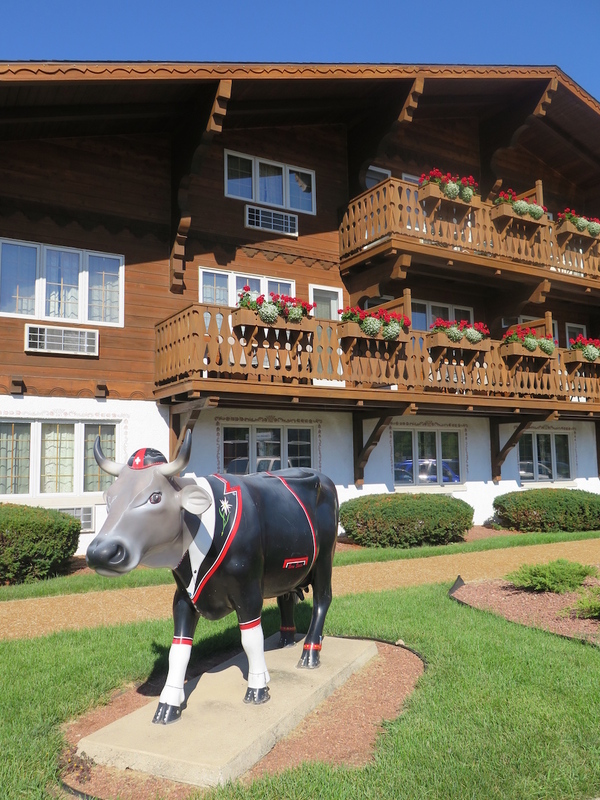 The Frau highly recommends a visit to New Glarus for those who feel at home in both Swiss and American culture. The thing that is great about New Glarus (besides the chalets and cheese options) is that you can come, park your big, fat American car that you really hate being required to have, and not move said car for an entire weekend. The whole town is walkable, there’s a bike path that runs through it, and the Frau’s favorite new restaurant, Sugar River Pizza, is a two-minute walk from the Chalet Landhaus Inn—even with a certain four-year-old taking her time. Room with a perfect view. If you're The Frau. 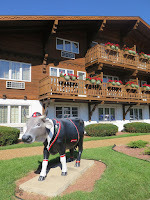 In fact, The Frau had such a nice long weekend in New Glarus for the second time this year, that she is going for a third time soon. To do another triathlon. She’s now addicted to both New Glarus and triathlons. C'est la vie, mitenand. Missing your more frequent blogs. I came across your blog quite recently, when I was looking for a family trip in the canton Aargau area. As well as you I am a foreigner in Switzerland (canton Bern), and I am also writing a blog about living here, because I love it here and I like to share, how beautiful this country is. In my blog I focus mainly on family friendly trips and activities (and bit of traveling abroad and DIY). So if you have time, you can visit my blog and if you like it, I'll be glad when you subscribe to my posts, or you will follow me on Facebook. Oh, that is awesome festival. I was there only one time but I have a lot of fun. Thanks for it.